At a long and at points contentious public hearing last night, a clear majority of speakers came out in support of protected bike lanes on First and Second Avenues in East Harlem. In addition to local residents, the public health community came out in force to demolish the opposition’s claim that installing bike lanes could worsen the neighborhood’s asthma rates. Community Board 11 had previously voted overwhelmingly in favor of the lanes, then rescinded its vote in the face of business opposition. Last night’s testimony sets the stage for another vote on the project, perhaps in January. More than 30 people spoke in support of the bike lanes, while only seven spoke against. The larger audience, a packed room of over one hundred, seemed to have a similar proportion of supporters to opponents. Local activist James Garcia also brought a petition with 850 signatures in support of the bike lanes, an amount he said only took seven hours to gather. The community’s elected leadership continued their sustained fight to bring safer streets to East Harlem. The bike lanes had two strong bases of support in the neighborhood’s student population and in the public health community. Speaking first last night in order to be able to make it home for bedtime were seven elementary school students from the Concrete Safaris afterschool program. “Biking is good because you don’t get diabetes and pollute the air,” said a girl named Abigail. 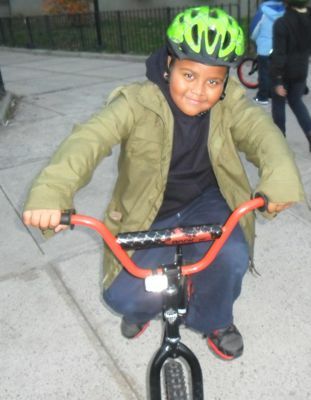 “I think East Harlem should have bike lanes. You get a ticket if you ride on the sidewalk and it’s extra-scary when you have to ride in a car lane,” argued Dwayne Marshall. La’Shawn Brown-Dudley, the deputy director of the Department of Health’s local district public health office, said her office hadn’t seen bike lanes worsen asthma anywhere in the city, but did see them as a way of encouraging healthy lifestyles. “We at the Health Department support the inclusion of these bike lanes,” she said. The bike lanes also won endorsements from Javier Lopez, the director of the New York City Strategic Alliance for Health, and two Mt. Sinai pediatricians, Kevin Chatham Stevens and Cappy Collins. The opposition to the bike lane was fierce, if not widespread, and included every anti-bike lane trope in the book. “I love bicycles, it’s just not for First Avenue,” argued Frank Brija, the owner of Patsy’s Pizzeria who wanted to move the lanes to Pleasant and Paladino Avenues, which run for ten non-contiguous blocks east of First. Mayor not only argued that the bike lanes would worsen traffic, but that they would block ambulances, prevent plowing, endanger senior citizens and sit unused. Rejecting evidence that the lanes work well in other countries and other New York neighborhoods, Mayor responded, “That’s not El Barrio, that’s not East Harlem, that’s not Spanish Harlem.” Mayor even cited the opposition of former transportation commissioner Iris Weinshall to the Prospect Park West bike lane to claim that DOT’s data couldn’t be trusted. When bike lane opponent Pablo Guzman started to complain that bike lane supporters — the elected officials, DOT representatives, and students — were allowed to speak ahead of the regular order of speakers, the event briefly broke out into chaos. Charges of slander flew and the core of bike lane opposition led by Brija and Mayor stormed out of the room. Mostly, though, the environment was one of thoughtful speeches and good nature. Harry Bobbins, a cyclist and bike lane supporter, even brought two Patsy’s pizzas in to show the bike community’s support for local businesses. One issue raised that clearly needs more work, for example, is the parking regulation along First and Second Avenue. Though the installation of the bike lanes will include some new loading zones, the majority of the parking along the two avenues will remain unmetered alternate side parking, which DOT Borough Commissioner Margaret Forgione called “very unusual for a commercial corridor.” The lack of meters means double-parking is worse than it needs to be and finding a short-term parking space much harder. Metering the spaces “would be a tremendous benefit,” said Forgione, but not an action DOT will undertake without community support. With a strong majority in support of the bike lanes, last night’s public hearing probably helped build some momentum for the community board to return to its previous stance of support for the project and for DOT to eventually move forward on installation. “The vast majority of the people in this room are very supportive of the lanes,” noted Forgione at the end of the hearing. Yeah! Ironically, my first trip on the East Harlem bike lane will be to Patsy’s. @HamTech87:disqus Likewise. It’s been ten years since I’ve had a Patsy’s slice. It was so good, I’m willing to overlook Frank Brija’s intellectually dishonest assault on livable streets as soon as I can get to his pizzeria safely on a bike. I don’t understand why we need a pizza place on First Avenue when there are perfectly good pizza places on Pleasant and Paladino Avenues. Good business people should reflect the communities they purport to serve. Instead may are not from the area and import their suburban values into the urban core. In fact, often they are the biggest obstacle to open spaces in front of their stores. The most frequent meter feeders I see are local shopkeepers and their staff. When I lived in the neighborhood, I would occasionally go to Patsy’s. Every single time was on bike, but it was never a pleasant experience, given the lack of decent bike facilities. I would have surely gone more often if I didn’t feel like I was risking my life to get there. A note from the front lines: people in the community really are open to having bike lanes on their avenues. Of the people who actually took the time to hear what we were asking them to endorse, the vast majority liked the idea and signed. I think 850 signatures in 7 hours speaks to that. Also, I’m glad to see business owners making the connection between bike/ped improvements and increased business. DOT is basically giving the street a free upgrade at no cost to the businesses, providing new street trees and easier pedestrian and bike access. These will attract far more customers than a few parking spots and certainly more than the lane of moving traffic ever brought. Seriously, do business owners expect that cars moving in the center lane of traffic will ever stop at their stores? It won’t be long before businesses are falling over themselves to get these free improvements. One of my favorite stops after my usual 20 mile ride is Ben’s Pizza. I can wheel up to the window, order a couple of slices to go, and they wrap it up in a bike friendly bag that I can hang from my handlebars. I haven’t been to Patsy’s but maybe they could learn a thing or two from Ben’s Pizza about customer service. Not everyone who enjoys pizza travels on four wheels. If Patsy’s and their friends do not understand what a great improvement in the community bike lanes are, I personally am planning to boycott them – and I mean all their locations. I invite all to do the same and to let them know why. Asthma indeed. their concern for the health of the neighborhood is quite touching. @ca435c90c15d4cb2d9755359b0762a0a:disqus I think the Patsy’s on 1st Ave is under different ownership than the rest of the Patsy’s in NYC, so you should be careful so as to not boycott restaurants that don’t have any problem with East Harlem bike lanes. @BenFried:disqus As others have posted, Brija is being very short-sighted because bike lanes will be very good for his business. The bike lanes, and Bike Share once it spreads to East Harlem and the Bronx, will dramatically increase his potential pool of lunchtime customers. The biggest employers near Patsy’s are hospitals, but all of the hospitals (except maybe Metropolitan if a bus comes quickly) are too far to reach during a typical lunch hour on foot or by bus. And few car-driving employees will waste time pulling their car out of a hospital’s parking lot to drive to Patsy’s for lunch, even with free on-street parking in East Harlem. The 3 employee counts are from a mid-90s report I found on the net, and it only looks at the hospitals, not the affilated medical schools. But you get the idea. By making it difficult and dangerous to travel to Patsy’s by bicycle, Brija is shunning the biggest pools of potential customers in and around East Harlem. @HamTech87:disqus Interesting point. At my last job, I made a lot of my coworkers jealous because I would bike to get lunch. I worked in SoHo, but I’d often get lunch in the East Village, which was easy to get to by bike, but way too time consuming to get to by any other means. Hello Team – Do we know when these would likely be completed? Cyclists would not be demanding the installation of Bike Lanes if Drivers were more courteous and cautious. @Uptowner13:disqus @BenFried:disqus Another angle for Patsy’s is the tourist business. Once Bike Share is implemented, Patsy’s could become a mecca for bike-riding tourists in midtown hotels. @Uptowner13:disqus somehow my post below had me responding to an “uptowner13” whoever that is. Bikes expand ones physical horizon far more than walking does. I was in Arlington, VA, a great place with wonderful walkability and transit-oriented development. Now they’ve added Complete Streets with bike lanes. I was able to bicycle (they have Bike Share too) from Arlington to Georgetown in 10 minutes. Who knew they were so close? confirmed this time after time (please, look them up). are than risk even one life by promoting dangerous infrastructure. @twitter-148763010:disqus You actually make a great point here. Cyclists are often told that sidewalk riding is more dangerous because they’re hidden from motor traffic, but move faster than pedestrians, hence surprising motorists turning at intersections. Functionally, a protected bike lane presents the same hazards as riding on the sidewalk. And even if that weren’t the case, the cyclist is still exposed to the same risk at intersections as they would be without the protected bike lane. Most cycling accidents happen at intersections, not in between. If we really want to make cycling safer, then we would build infrastructure which totally separates bicycles from everything else, avoiding intersections with motor vehicles altogether. Incidentally, such infrastructure would increase bike mode share far more than any other solution. Look at how many cyclists go out of their way to use the bikeways on the Hudson and East Rivers. If we had similar bikeways throughout the city, we could easily get bike mode share past 20%. Ian and Joe clearly aren’t familiar with NYC DOT’s designs that offer daylighting through ‘mixing zones’ or offer separate signals. Save your anti-facility screeds for your vehicular cycling message boards. Though even one of your own- John Allen- gave the thumbs up to the designs here. Actually, the “mixing zones” are a terrible idea because they once again put cars into the mix when the whole point of protected bike lanes is to take cars out of the mix. And as I said, cyclists still deal with the hazards of vehicular cross traffic, in this case literally every 260 feet, and they still encounter red lights way too often (whether or not they obey them is of course another story). If there has been any decrease in traffic related injuries on account of protected bike lanes, then it’s solely because motor traffic on the narrowed street is now moving more slowly (a worthwhile goal in its own right). Note that some cyclists avoid these protected lanes because they say they’re much slower than just riding in the street. Safety is a laudable goal, but good designs avoid sacrificing much travel speed in the quest for safety. The only protected bike lane I’m aware which has a good design is the one at PPW. Here cyclists don’t encounter motor vehicles or traffic signals for 19 blocks. There are also several totally separate routes, but they are unfortunately way too short, and disconnected from each other. I don’t see what vehicular cycling has to do with anything here. I’m in favor of more cycling only infrastructure, but only infrastructure which makes cycling faster/safer/more efficient. The only kind of infrastructure which can satisfy all three of these criteria would be bike routes which are totally separate from motor traffic, and have no stop signs or traffic lights for miles-the point of these routes being to allow cyclists to get from point A to point B far faster than they could riding on regular streets with myriad sources of delay. If we want this “bikes as transportation” thing to work long term, then we need to think in terms of both safety and speed, same as with any other form of transportation. “Protected” bike lanes could still serve as part of this, but mainly to go the last blocks to/from the final destination after taking the bike-only highways for most of the journey, not as the primary route. Ian has pasted his above post almost verbatim in more than one place. I replied to it elsewhere ( http://www.streetfilms.org/kinzie-street-the-first-of-many-protected-bike-lanes-for-chicago/#comment-384917527 ) so I won’t repeat it here. Everyone should read @qrt145:disqus ‘s response to Ian Brett Cooper. It crushes Cooper into dandruff–especially about the studies that “support” Cooper’s claims. Thanks for sparing us the work, qrt145. I read through the entire string of comments over there, and even posted a response. One thing being overlooked here which should give pause is the fact that quite a few experienced cyclists are avoiding these protected lanes, even sometimes riding with motor vehicles on the same street. From a public relations standpoint this is a disaster because you’ll have critics complaining the protected lanes cost a traffic lane, and despite that not all cyclists are using them. That in turn gives fodder to those who would have them removed. Cycling-specific infrastructure is a good thing to be sure, but we must make sure in the future to build infrastructure which is usable and appealing to all levels of cyclists. The Hudson and East River greenways provide fairly good examples of this, although even those can be improved upon. The nascent network of cycling superhighways being built out in the Netherlands is probably the best example yet of what we should be building a lot more of. On those roads you’ll find both families with small children cycling for pleasure, as well as experienced riders on velomobiles traveling many tens of kilometers at high speeds. In other words, the roads are useful to all types of riders.